We were known to the enemy as 'grey ghosts'. We could be here, and we could be there... The Grey Ghosts were New Zealand's Vietnam veterans. Their powerful story includes chilling accounts of death, injuries and emotional breakdown, along with the intense comradeship of soldierin... read full description below. We were known to the enemy as 'grey ghosts'. We could be here, and we could be there... 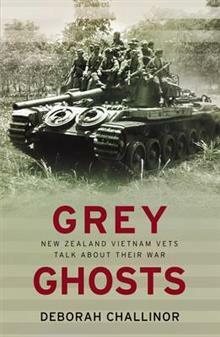 The Grey Ghosts were New Zealand's Vietnam veterans. Their powerful story includes chilling accounts of death, injuries and emotional breakdown, along with the intense comradeship of soldiering, and a pervasive sense of humour that is uniquely our own. Acclaimed writer and historian Deborah Challinor interviewed 50 men who served in Vietnam, who speak out about 'fragging' (killing superior officers), the New Zealand Government's role in Agent Orange and chemical exposure, and their hostile reception when they returned. The result is compelling, reliving the Vietnam experience in vivid detail. First published in 1998, this updated edition includes new material on the subsequent handling of veteran's claims, and the reconciliation parade on Queen's Birthday weekend in 2008, when the men were finally welcomed home. Deborah Challinor is a writer and historian living in Hamilton, author of the bestselling historical trilogy Tamar, White Feathers and Blue Smoke, the number one bestsellers Union Belle, Kitty, Fire and Amber, and several non-fiction titles, including Grey Ghosts. She has a PhD in New Zealand history, and in the past has won the RNZRSA Military Studies Scholarship and a research internship at the Australian War Memorial in Canberra. She has taught courses at the University of Waikato on the New Zealand Wars, and on how to research and write New Zealand historical fiction. She has also written extensively for the Waikato Times.